I’m a Google user by default. It’s the one that’s programmed into my typing hand more than any other website, and even though it fails me at times, I still lean on it in times of uncertainty. It was just recently, however, that I started to expand my search world, grabbing at new straws to help meet my research needs. These three seem very promising, and are rather fun, as well! Hakia - Do you ever wish you had a personal search assistant designed to sort through the garbage in your search results? 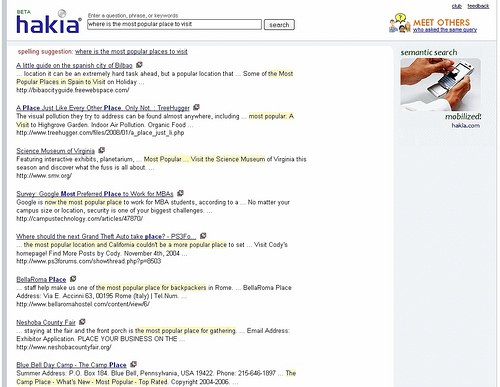 Hakia , a truly effective semantic-based search tool, does just that. While limited at the moment in its Beta version, I’ve been very impressed so far. Hakia uses three criteria to qualify its search results: 1) it must comes from a credible source recommended by librarians 2) it is the most recent information available 3) it is absolutely relevant to the query. How does it compare to Google search results? Just check out this sample for search term “Is there any remedy to tuberculosis?” The verified results appear first in Hakia (highlighted in red), followed by regular results. In Google, they are all mixed together, organized by statistical ranking. Curious to find out about others with similar searches? Just click on the icon for “Meet Others who asked the same query” for chat boards relevant to your search. SortFix - This nifty tool came to me as a tip from Mary Ellen Bates at Bates Information Services (for updated search new, check out her monthly tip.) It’s a hybrid off all my favorite applications (search engine, thesaurus, dictionary, and comparison between websites.) How does it work? Simply visit SortFix.com and type your search term. Upon hitting “enter”, you’ll get Google results, with neat tabs for comparing results in Yahoo and the dmoz open directory project. Now it gets really cool. 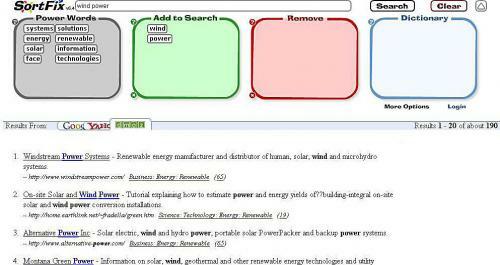 Using Drag-and-Drop features, you can refine your searches using their suggested “Power Words”. Not feeling the results? Add or remove search words easily by placing them in the “Add” or “Remove” boxes. (It reminds of those magnetic word poetry kits.) Use the dictionary for more fun, and if you’re really daring, you can sign up for advanced features! Normal people collect stamps, spoons, or trading cards. I collect great search tools. Got another that I should check out? Let me know via the contact form, or leave a comment here with your best stuff! Mahalo also has great general search results- they're all human-built results so you know the pages are relevant. Plus, you can join thier editorial staff and create your own pages to get some extra $$. Also, UpTake.com is great for searching for travel-related results, it's all in one place there. I've heard of Maholo when it was first starting out. I'll have to revisit it now. And thanks for the other recommendation, too!